The BEHUMANE program is a fundraising and education program in which the Humane Society of Yuma will spend a week at each school and conduct age specific animal welfare presentations in all classrooms. At the end of each week, the Humane Society of Yuma will be hosting a Walk-a-thon to showcase the student’s fundraising efforts and a few of the animals from the shelter. 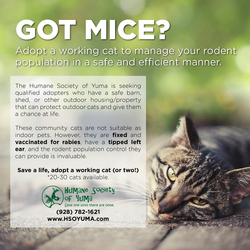 The Humane Society of Yuma hopes that students end the program more informed about their local animal welfare issues and will hold onto the values and lessons learned from the program. This program is a long-term investment for our community to address pet-overpopulation and animal cruelty. 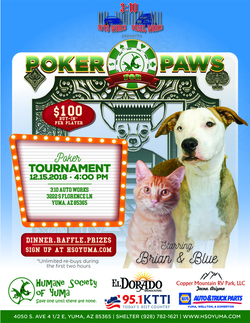 Fundraising in the schools for a local non-profit, such as the Humane Society of Yuma, will have a meaningful impact in their community. Prior to the Humane Society of Yuma’s visit each student will receive an envelope and instructions on how to launch their web-based fundraising page. 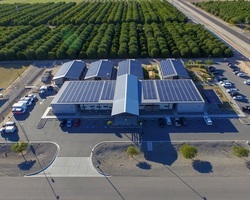 This year, the Humane Society of Yuma’s BEHUMANE program will teach over 4,500 students, expose them to local animal welfare topics and hopefully engage them in local philanthropy. VIP Behind the scenes Humane Society tour, lunch, & HSOY swag! 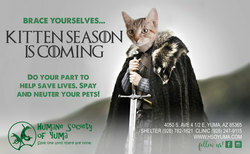 Create your account by clicking "Become a Fundraiser"
Personalize your page with a photo of you and/or your pet. Tell your story. 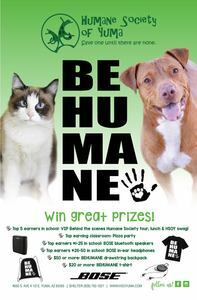 You can customize your message; please share what BEHUMANE means to you! Launch your personal fundraising page. Email your personal page to friends and family. Post your personal page on social media. Be sure to thank your donors! For example: Handwritten letter, email, or phone call.